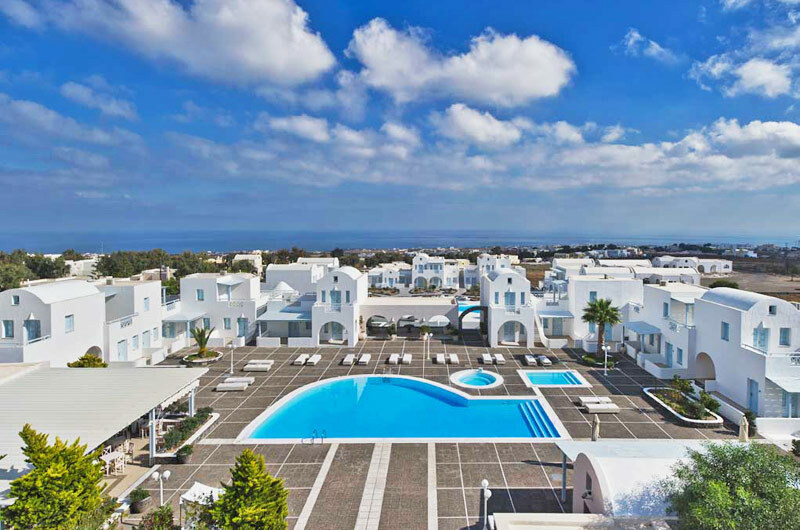 El Greco Resort is located only 400m away from the centre of the magnificent Fira town, the capital of Santorini. Its traditional and colourful architecture enhances the spacious surroundings, creating a unique scenery for your leisure time. The friendly and helpful personnel takes care for all the needs of the customers. El Greco is a well balanced establishment equally suitable for families, due to its location and facilities, and for couples, due to its colourful reflection of charm! The closest beach is Monolithos, 7km away, the black sandy beach of Kamari is 12km away and Perissa, the largest beach of Santorini island, is 14km away. El Greco Resort was build in 1996 and has 71 elegantly furnished and decorated rooms. All rooms studios and suites with traditional and colourful architecture they are designed with respect under the strictest of standards in order to maintain the happiness of the most demanding guest providing comfort and safety. Standard room: air-conditioning (heat & cold), mini fridge, direct dial telephone, satellite-TV, private safety deposit box, hairdryer, marble bathroom, balcony or terrace are there to make you feel peaceful and calm before and after you adventures in Santorini. Studio/ Superior room (up to 4 persons): elegantly decorated one bedroom studio that can accommodate with living room and fully equipped kitchenette, air-condition (heat and cold), mini fridge, direct dial telephone, satellite TV, private safety deposit box, hair dryer, balcony or terrace. Suite (up to 5 persons): main bedroom upstairs and specious living room. Suites are traditional furnished with fully equipped kitchenette facilities, air-condition (heat and cold), mini bar, direct dial telephone, satellite TV, private safety deposit box, hair dryer, balcony or terrace with a view either to the volcano either the pool. Ideal for honeymooners that want the perfect background for the first days of their new life. Greco Café is a friendly coffee house and relaxing place serving traditional Greek Coffee, Ouzo or Local Wine served with titbits of the area, while playing backgammon by the pool. At the El Greco Pool Snack Bar Anemi you can enjoy a delicious Snack or relax after swimming, by drinking fresh juice, beers or exotic cocktails. At the Central Restaurant El Greco with beautiful veranda, which is next to the pool you can enjoy your breakfast at the American Style Buffet or dinner. Lobby, charming, elegant and spacious complete with traditional furniture and TV lounge. -Children under 3 years old are free of charge when sharing room with parents.